Don’t call me a square, but I am a fan of blocks. After all, the pyramids were made from blocks, as was the Yellow Brick Road. Lego uses blocks, as does Minecraft. Blocks are sturdy, blocks are reliable, and blocks are here to stay. So what happens when multiple kings of varied species are all in a race to see who can control the most area of an island using only blocks? Well, people place a lot of blocks, for a start. Blocks. The game of blocks I’m referring to is Kings of Artifice, an area controlling game of block placing strategy for 2-4 players and published by Wyrd Miniatures, with games generally lasting about an hour long. Did I mention that this game has blocks? Well, it does. A lot of them. Lots of little, wooden blocks, each in a colour for each player. 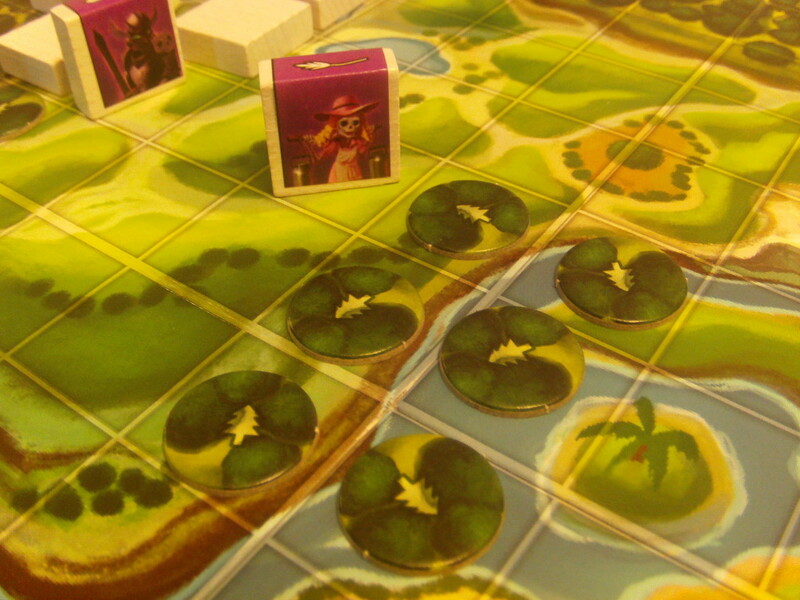 Each player will command a different kingdom, whether it be the humble humans, slimy snail-people, grim skeletons, or- well, they’re cat people. Fans of Doctor Who or Bedknobs and Broomsticks will feel right at home, here. However, any differences between the races are purely aesthetic, so you will essentially choose to be brown, green, white, or grey (respectively). So, what do you do in this game? Well, each kingdom has a selection of units, which they can use to do certain actions (mainly building various structures out of blocks.) 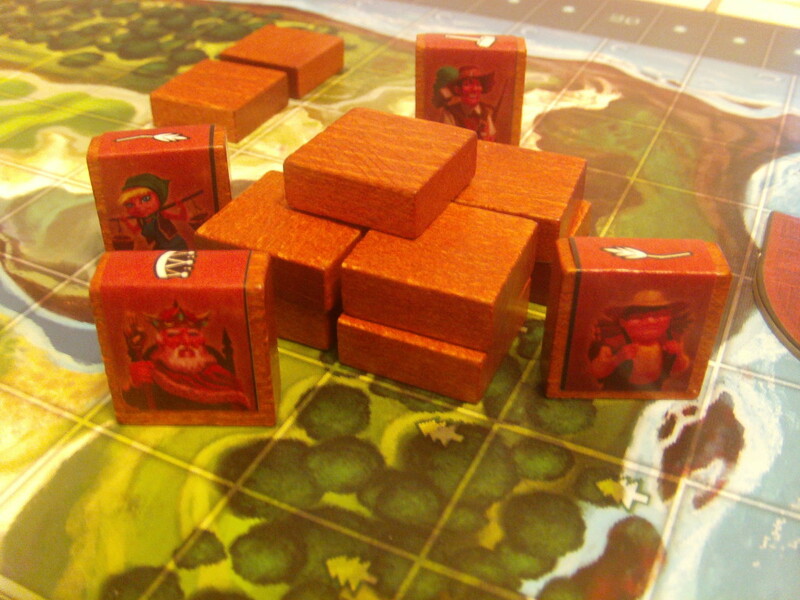 Your King can summon a unit to the board and construct palaces, your Villagers build walls and houses, Artisans pair with other units to create advanced structures (anything other than a house or wall), Horses move units great distances on the board, Thieves steal from other players and can climb walls, Knights kill opponents and construct battlements, and Warlocks cast spells and construct towers. 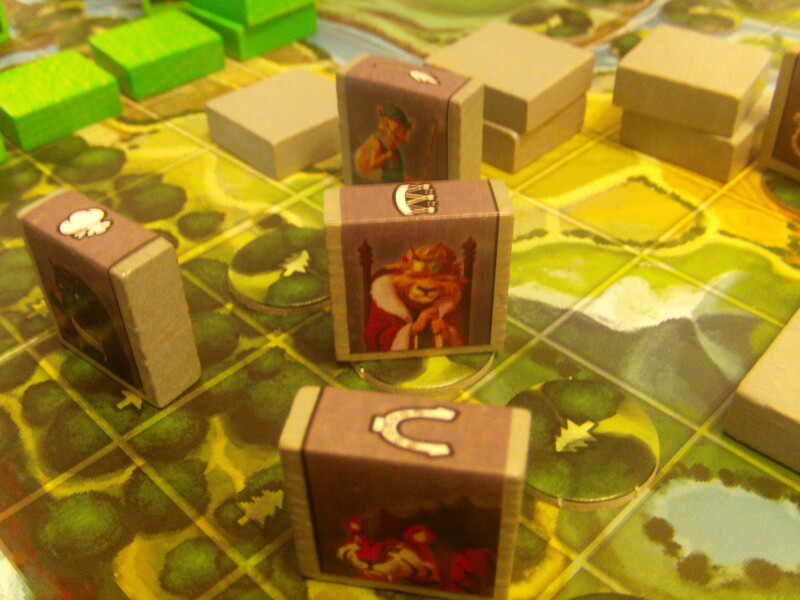 Your units are blocks with stickers on them and they construct things by placing blocks on the board. Plenty of blocks to go around. The interesting thing is that each building sort of builds upon what comes before it and each structure you build gives you a certain amount of points- for instance, a single block is a wall. Put another block on top and you have a house and you can give yourself a point for your trouble. Do you have four houses together as a big square? Put another block on top in the middle of your construction and you have constructed a block-tacular palace, worth a massive nine points (in addition to the points you already scored for constructing each house). Or, you can place a block on top of a single house to construct a tower- which can loom above the board as high as five blocks tall (and scoring you a point each time you add a level). In addition, now if you move your Warlock into your tower (placing it on top of the teetering pile of blocky wood), you can magically teleport your Warlock from one of your towers to another. So while each player may start the game by placing walls hither and thither, what they do with those walls is entirely up to them. 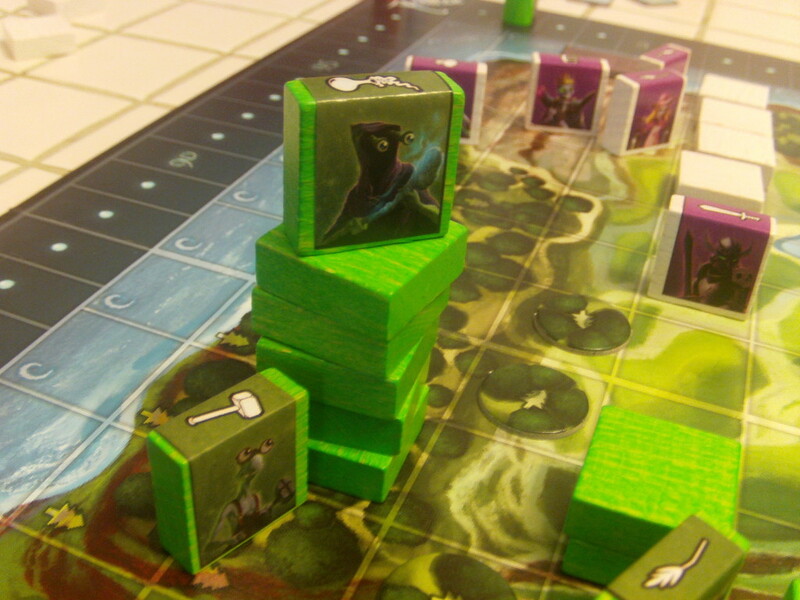 And once the ending conditions are met (essentially someone running out of blocks to place) all players have a final round to try to get their units into position to score bonus points (such as having a King next to palaces, Villagers next to houses, or Warlocks atop towers). Here’s the thing, though- this island just simply is not big enough for all of you. Very soon, you’ll find yourselves getting in each other’s way, which restricts where you can move your units and ultimately, what structures you can build. This game quickly devolves into a race between players to carve out the biggest chunk of the island that they can- and then trying to figure out what they can do with their blocks once they have. So this is a game of friendly jostling and competitive block laying- with blocks. To add to the variety, there is the inclusion of the Spell Cards and Final Scoring Cards. 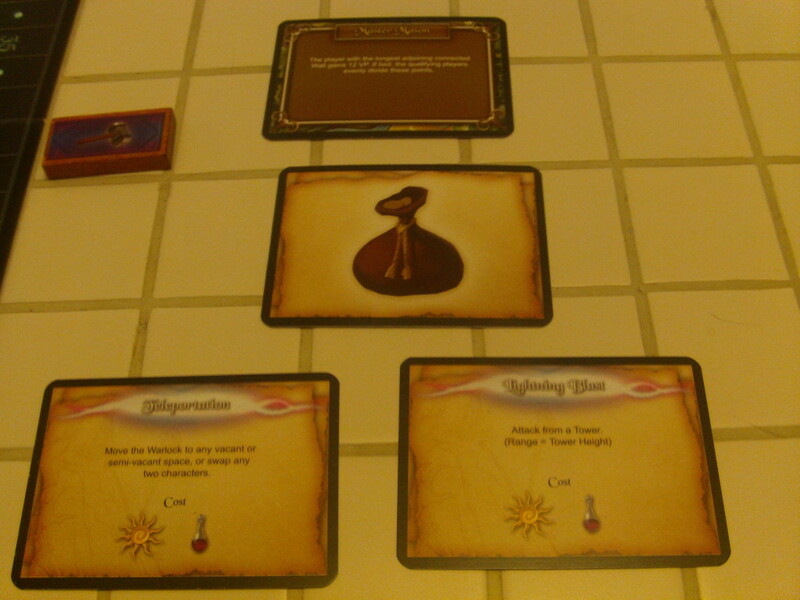 Each game, you’ll deal out to the table a random scoring card and two random spell cards. You can use your Warlock to cast one of the two spells once per turn (such as a free upgrade to a building, free movement for your units, or even moving your walls to new positions!) And the Final Scoring Card gives you special things to keep in mind when doing the final scoring for the game. Maybe you’ll get extra points for every tower you build, or maybe you’ll have points subtracted for every building of yours that is touching one of the lives that separate the quadrants of the map. The point is that the inclusion of these cards makes every game of Kings of Artifice different. The Final Scoring Card gives you a goal to work towards each game and the Spell Cards mix up how each game plays. So this game has what I prize greatly about well-made games: replayability. 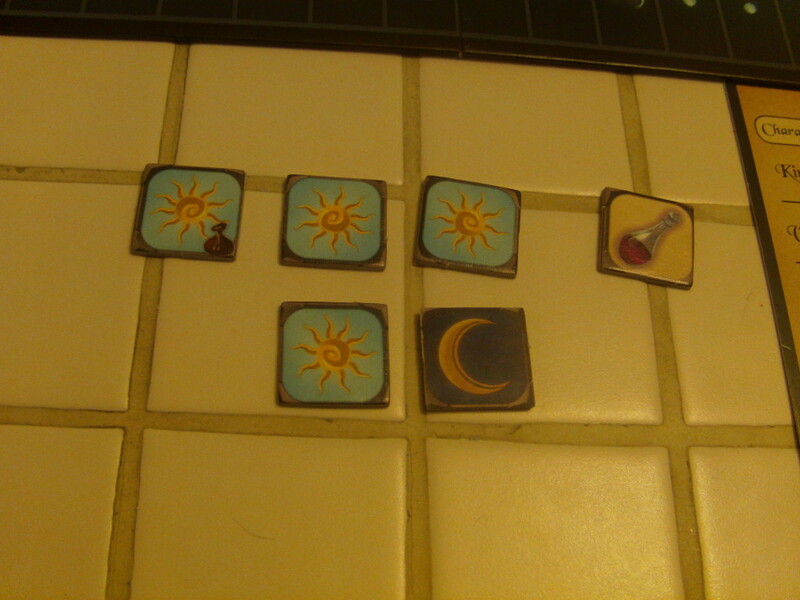 If I did have a complaint about this game, it would be this: Those stickers on the unit blocks? You need to place each of those yourself, which means it can be a while for you to get ready for your first game. In addition, as I alluded to earlier, it would be nice if each of the races played differently. Furthermore, the manual is a little clumsy. Most of the information in it is on the Player Aide Cards, so the manual could really do with some slimming down. However, these really are minor quibbles. 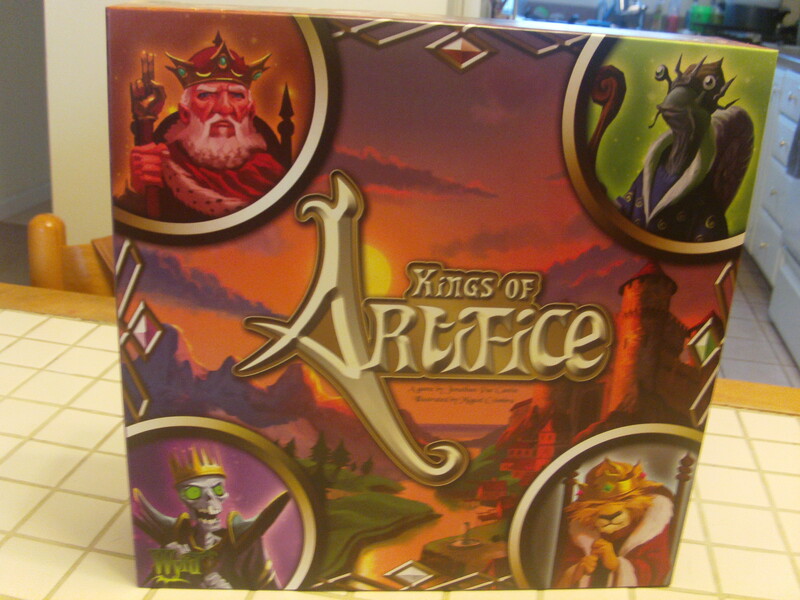 If you want to lay down blocks with your friends like a bunch of mad, block-laying fools, then A Space Ahead heartily recommends Kings of Artifice for your game collection. Blocks.